A dead climate satellite that has been circling Earth for 20 years will make a fiery death plunge this week, with some pieces of the 6 1/2 ton spacecraft expected to reach the surface of the planet, NASA officials say. The bus-size Upper Atmosphere Research Satellite, or UARS, will likely plummet down to Earth sometime around Friday (Sept. 23), according to NASA's latest projections. There is a 1-in-3,200 chance that UARS debris could hit a person, though NASA considers that scenario extremely remote. The space agency's space debris experts predict that at least 26 large pieces of the satellite will survive the scorching temperatures of atmospheric re-entry. But exactly where the UARS satellite debris will fall is uncertain. NASA officials have said that the drop zone for UARS satellite debris could be anywhere between the latitudes of northern Canada and southern South America, an area that includes much of the planet. The satellite should re-enter over a 500-mile (804-kilometer) track, according to NASA officials. Since 75 percent of Earth is covered with ocean, there is a high likelihood that the satellite will re-enter over the sea or a remote, uninhabited stretch of land, Victoria Samson, the Washington Office Director of the Secure World Foundation, an organization dedicated to the peaceful use of outer space, told SPACE.com last week. If the satellite does fall while flying over a populated region of Earth, skywatchers on the ground could see a dazzling light show if they have clear weather, Nick Johnson, chief scientist of NASA's Orbital Debris Program at the agency's Johnson Space Center in Houston, said on Sept. 9. And UARS is falling closer to Earth with each passing orbit. The huge satellite is 35 feet (10.7 meters) long and 15 feet (4.5 m) wide, and has been falling faster than anticipated (initial re-entry estimates pegged its plunge to somewhere between late September and early October) due to increased solar activity last week. Solar activity can cause the Earth's atmosphere to heat and expand, increasing drag on low-flying spacecraft. The U.S. Strategic Command at Vandenberg Air Force Base, Calif., and NASA are keeping a close eye on the falling UARS spacecraft, but have said that they will only be able to pinpoint the satellite's point of impact to within about 6,000 miles (10,000 km) about two hours before re-entry due to its unpredictable nature, U.S. Air Force Maj. Michael Duncan, deputy chief of the U.S. Strategic Command's space situational awareness division, told reporters on Sept. 9. NASA launched the $750 million UARS spacecraft in 1991 to study the ozone layer and other chemical compounds in Earth's upper atmosphere to better understand their role in the planet's climate. The satellite was initially designed for a three-year mission, but it lasted for 14 years until newer satellites made it obsolete. 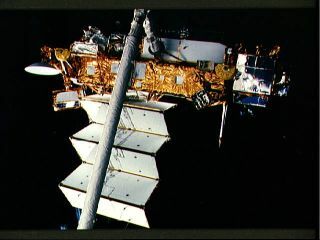 The UARS satellite was decommissioned in December 2005 when NASA commanded the spacecraft to fire its thrusters one last time to use all its remaining fuel to place it on a years-long path toward disposal in Earth's atmosphere. If any pieces of the satellite debris do fall over or near a populated area, NASA and the U.S. military warn the public not to touch UARS remains. Instead, local law enforcement officials should be contacted, NASA officials said. Any debris from the UARS satellite still remains the property of the U.S. government and cannot be sold for profit to collectors or on eBay, they added.